The Australian Graphic Design Association provides this definition. One who has the artistic sensibility, skill and experience and/or training professionally to create designs or images for reproduction by any means of visual communication, and who may be concerned with illustration; typography; calligraphy; surface design for packaging; or the design of patterns, books, advertising and publicity material, or any form of visual communication(2). One who has the sensibility, skill and experience and/or training professionally to create designs or images for reproduction by any means of visual communication, and who may be concerned with graphic design; illustration; typography; calligraphy; surface design for packaging; or the design of patterns, books, advertising and publicity material; broadcast, interactive or environmental design; or any form of visual communication(3). Visit this page on the AGDA’s website for graphic design job descriptions. View the portfolios from the 2012 BFA class here. Featured is Jarrod Tredway’s “Mullet Festival” Campaign—a fish fry in the front, a party in the back. Jarrod received the School of Art + Art History’s Outstanding Undergraduate Award and was the featured student speaker at the College of Fine Art’s Graduation Ceremony. The Icograda Design Education Manifesto 2011 was launched on 27 October 2011 at the Icograda General Assembly 24 in Taipei, Taiwan (Chinese Taipei). A QR code is a small rectangular barcode that can be printed on any of your print products. It contains a link to your LinkedIn profile, Facebook page, web page, portfolio site or any other piece of cyberspace that you’d like to send people too. It utilizes smart phone scanning technology to navigate to a specific website; as long as the viewer has a QR reader application on their phone, they can take a picture of a QR barcode and the application will navigate them straight to that piece of cyberspace via their phone. Click here to view their combined websites with links to individuals. Job Description: RegisterPatient.com is a web-based patient registration system that allows patients to register for their doctor’s appointment online prior to getting to the doctor’s office. We’re currently seeking graphic design interns to help us make the system as aesthetically pleasing as possible. Our system is currently live and used in doctor’s offices around the country, but it’s simply just not pretty enough. That’s where you come in. We are a start-up company and encourage an innovative and entrepreneurial work space. As an intern at RegisterPatient, you will be given the freedom to create your own projects and tasks. Interns will choose their own hours and work attire, and will be provided with the tools necessary to complete their projects. Throughout your internship, you will learn the ins and outs of getting a web-based start-up company off the ground, and will be a core part of the team. Our office is about a 10 minute walk from the art school (near the Warphaus), and parking will be offered for all interns. Option for credit. This internship is unpaid. 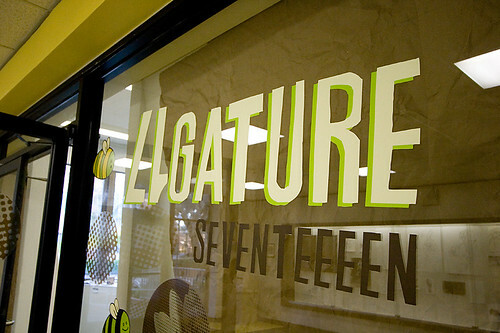 UF Ligature 2008, a photo by thoughtandtheory on Flickr. A typeface by Shantanu Suman, UFGD MFA 2013. Cassie McDaniel, a senior graphic design student who played a lead role on the 2006 Wixárika Calendar project and received a UF University Scholars Fellowship, is going to be our first student spending a year at the University of Leeds under the new UF/Leeds exchange. She was recently awarded the University Women’s Club scholarship and a University of Florida International Center Scholarship. This calendar was designed by uf graphic designers Cassie McDaniel, Avery Smith, Maria Rogal, in collaboration with Dr. Sarah Corona from the Universidad de Guadalajara and the Wixárika community of San Miguel Huaixtita, Jalisco, México. It was developed in spring 2005, with the participation of the class of 2006 – a stellar group of people. Visit the project web site.